Unsatisfied Satisfaactionns are those which a person feels when someone close to him whom he loved the most is lost with time and situations but still he is satisfied today thinking about his lover’s wellbeing and happiness. 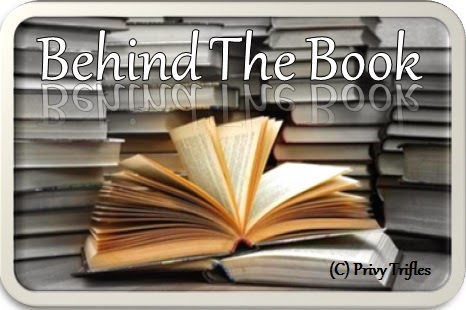 RIITIK belongs to a Punjabi Family who used to work in a travel company and fell in love with NIYATI who belongs to a Brahmin Family and was working in a hotel. They both spent amazing time together. They were with each other in thick and thin. They must have had one of the best love moments anyone could think of. But God had written something else for their destiny. Riitik meets with an accident and there from the things start to change in their lives. Niyati has been a career oriented gal but love for her guy changed her totally. She had to choose between her career and love. It’s about the time’s play which changes their lives and gets them into various obstacles. Is there love worth enough to cross all the hurdles of problems and get them together? 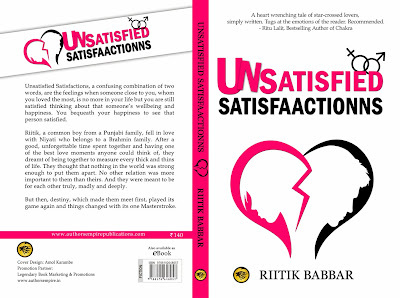 1.Unsatisfied Satisfaactionns your debut novel- can you tell us something more about it? A: Well its based on my true love story. You can say it's an amalgamation of fiction and some true events. Its about a Punjabi guy falling for a Brahmin girl and how do they deal with certain situations. Readers would be re-living the true love. That's all I can say for now. 2.Is it a true story or pure fiction? A: Like I mentioned earlier. Its a mixture of both fiction and my experience in love. I had to put some fiction because I wanted to make it bit readable for the readers. 3.If you were asked to pick one who would be your favourite character in the story and why? A: Stuti would be my favourite character who actually came out as an angel who made me come out of the world where my mind was stuck from long. She was actually there in real life as well. All the characters are real but with changed names. 4. Given a chance would you want to change anything in the book? A: I wish I could end the book on a happy note but I actually wanted to portray the real scenarios that I experienced. 5.What pushed you to become an author? Was it a childhood dream? A: I never thought in my dreams that I would become an author someday. I am an author by chance. Its just I had so many things stored inside from years and wanted to pen them down. 6. Were there any hiccups you faced in the process of getting your book published as is generally misconstrued? A: Getting a book published is not a big task if you have written a good and relatable. However making it reachable to readers and circulate is what the real task. 7.From a working professional to becoming an author. How does it feel to be here right now at this moment? A: I never wanted to be a professional author but I wrote to inspire the generation that we have because I experienced that True Love still exists. Its all about your conviction in your feelings. I would then be feeling good when my work would be able to change at least one person's emotions. 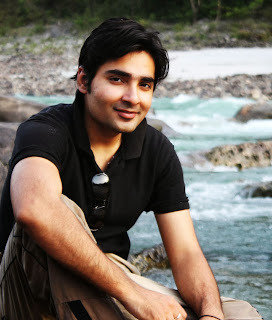 8.Who is your favourite author and why? A: Well I like Indian authors like Chetan Bhagat, Ravinder Singh and Durjoy Dutta who actually contributed to the Indian literature but I am a big time fan of Sidney Sheldon. I wish I could write a novel like Doomsday Conspiracy someday in my life. 9.Tell us something about your future plans or upcoming projects. A; As of now I am focusing on this but my main stress would be on writing inspiring projects in simple language. I want that my readers should be able to relate with the content without referring to the dictionary. 10. Any parting words for all your readers who are looking forward to your book. A: I would just like to say that life comes with an expiration date but True Love doesn't. We would like to THANK YOU very much for sparing your time to be here and wish you all the best for your book! P.S: You can get in touch with the author directly at his page.